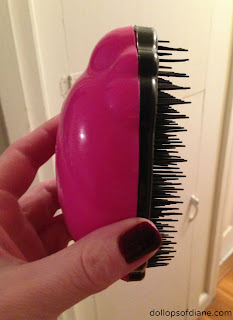 Dollops of Diane: Got Tangles? Get the Knot Genie! Isabelle has beautiful, long red hair. It’s the kind of hair that gets lots of compliments as well as lots of tangles. Brushing her hair was always a dreaded task. I would use conditioner as well as detangling spray but it was still a challenge. There were always tears being shed every time we brushed her hair. It was a nightmare. Then one day, I found out about the Knot Genie and our lives were eternally changed. We’ve had it for a few months now and not ONE tear has been shed. They claim the trick to it is the different lengths of the brush’s bristles but I think it’s just plain magic. Last week, twice I found myself talking to people (one a random dad at a play place!) about how much I love the brush so I figured I should share it here as well. If you are battling with hair drama each morning, you might want to give it a try. I got ours as a deal on Amazon (Knot Genie Detangling Brush) one day for less than $10 so keep an eye out for a good deal.